It is important for Gainesville, Florida to strive for quality of life as a way to encourage people to live in more central, compact locations and, therefore, to discourage sprawl through personal choice rather than Draconian regulations. I am rather annoyed by what seems like an excessive use of sirens by the emergency vehicles of both the city and county. A number of other people have mentioned the same annoyance, and some have toyed with the idea of moving out of their more central location to a more remote area away from the constant sirens. I’ve also heard from some (and my own observation confirms this) that there is a noticeable difference between the level of siren use in this city compared to other cities. It has gotten so bad that I often feel like I am living in a war zone like Beirut, or Berlin during WWII. I remember reading in the noise control literature when I re-wrote the Gainesville noise ordinance that Boulder CO was able to significantly reduce the siren problem by simply having their emergency administrators instruct their staff to go easier on the sirens. And, there was no epidemic of babies dying in burning buildings after this happened. I do not know if that would work here, but it shows that the problem can be reduced without major loss of life or other feared outcomes. The Duckpond neighborhood where I am living in downtown Gainesville has had an ongoing problem with vacuum trucks, which many shopping centers are now using to clean their parking lots. We’ve had this problem for about 3 or 4 years. I’ve called the Gainesville Police Department about 15 times over the years on this, and it is always interesting to observe how the officer will try to claim that it is either not a violation, or that they are simply trying to run a business — and then being a bit surprised when they learn that I wrote the noise ordinance and therefore know a few things about whether it is a violation. Given the fact that you can hear the high-pitched whine of the trucks for a distance of 10 to 20 blocks, and the fact that the twice-weekly vacuuming occurs at hours like 5 am or midnight, it is rather obvious to me that we are experiencing an on-going violation. I often hear the argument that this is the price one must pay for living in a central city location. I don’t buy it. While there are certain ambient noises that a person in a healthy central area should expect, such as the sound of people, cars, music, ballgames, etc., I do not believe that excessive siren use or vacuum trucks are a necessary part of a vibrant, healthy downtown. I agree that people should have lower expectations of peace and quiet if they choose to live in a central area that is vibrant. But increasingly, I believe we have growing noise problems due to factors such as technological changes that have little, if anything, to do with a vibrant downtown. I believe it is in our power to reduce these noise problems, and to do so as a way to further our sprawl discouragement and quality-of-life objectives. We’ve already instituted several financial and regulatory mechanisms in which we encourage people to flee to sprawl locations. Let’s not further encourage this with things that we can control. 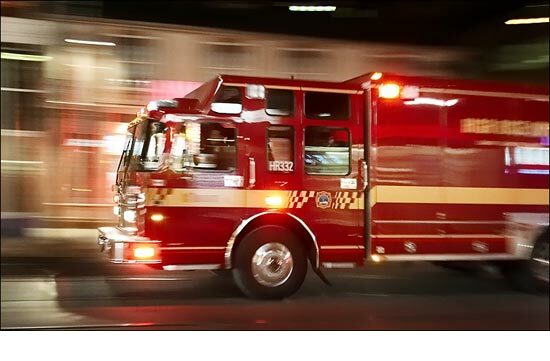 Fire engines and ambulances will no longer use their red lights and sirens when responding to minor medical emergencies, fire officials announced this week. Fire department spokesman Lt Tom Barron said the risk to both responders and the public is greater than the reward for faster response to non-life-threatening calls when emergency vehicles respond with lights and siren. To ensure an appropriate response, dispatchers at the Colorado Springs Public Safety Communications Center have been trained in how to categorize calls for help, Barron said. The dispatcher will remain on the line to instruct the caller on how to care for the patient until help arrives.